When it is time to select a window company to replace windows in your home or business, you need to feel secure in the quality of products offered. As a window company, we offer window products that give you the value you deserve and the service you need. A preferred supplier of JELD-WEN window and door products, we offer a wide array of new and replacement windows, patio doors, AND MORE. To feel, see or touch the many window options available to you, simply visit our newly renovated showroom or get inspired by clicking on our idea gallery. Whether you are remodeling or just beginning construction, you can depend on Tree Court Builders Supply to assist from start to finish. Gain a deeper understanding of what determines quality and performance in windows. Learn what features and materials enable windows to contribute to your home or business’ comfort, energy performance and aesthetics. Our experienced sales team members will lead you through the process making it easy for you to find the exact products you need to make your home or business complete. Build your vision with ease. 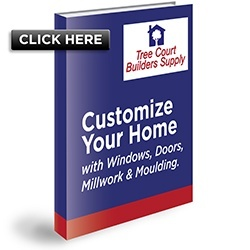 Visit Tree Court Builders Supply today.